Assaf Harel was born in Israel in 1972. He studied theater, music and architecture, and then moved to a career in television. 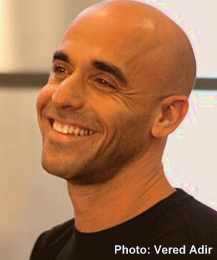 Three of his TV series won the Israel Film and Television Academy's "Best Comedy" award, and one of them, which he also directed, was Israel's first animation series. He has also written a daily satire program, written and directed a documentary film on the fall of David Ben-Gurion and anchored a culture program on Israel's Science Channel. At present, Harel is CEO at Jovie, a mobile video app, which he co-founded in 2014.